Since January 2010, I’ve had a muffin recipe lying around that I pulled from Everyday Food magazine and tacked onto the fridge. I pulled it off of the apartment fridge door when we moved to a house and tacked the recipe onto our new fridge. And then I had a baby in June 2011. Who has time to bake with a newborn? So there sat the recipe, yellowing, collecting dust. Until now. 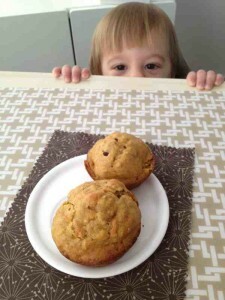 When you’re feeding a toddler, you find that certain things are almost always a hit, and muffins is one of them. Who doesn’t love a muffin, right? 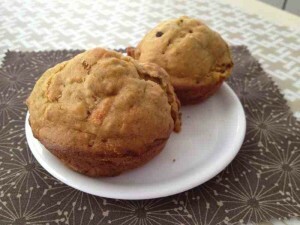 The title “healthy morning muffins” and the nutrient-rich ingredients like carrots, bananas, oats and raisins pulled me in, as some days, the kid just cannot be pleased, but I want him to enjoy something nutritious. And did I mention I’m pregnant with kid #2? Ay caramba! This photo isn’t staged. Honest! He was really excited to eat a muffin. This recipe is a lifesaver. The original is smaller, making only about a dozen muffins. So I retooled it a bit and after just two tries, I’m pleased with the results. I also added in some pumpkin/squash puree to boost nutrients and moisture. Preheat oven to 385 and spray muffin cups with baking spray. In large bowl - preferably attached to a stand mixer - measure out flour, brown sugar, baking soda, baking powder, spices, salt, oats and raisins. Stir to combine. Add canola oil, eggs, milk, pumpkin/squash puree, shredded carrots and banana(s). Fill cups about halfway to 3/4 full and bake about 17 minutes, depending on your oven. Top of muffins should feel springy. Store in the freezer in an airtight container and pull out as many as you need when you need to enjoy them! Do you have a great muffin recipe? Share it with us! I have 10 grand kids 6 and younger I definitely will have to try this one.